On November 26, 2008, attackers armed with automatic rifles and grenades spread out across the Mumbai, India's largest city by population, taking hostages and killing people in hotels, restaurants, hospitals, a train station and an Orthodox Jewish center. The attacks, which drew widespread global condemnation, began on 26 November 2008 and lasted until 29 November, killing 164 people and wounding at least 308. The attacks seemed clearly to be aimed at foreigners visiting the city. The attack virtually paralyzed the city. Ten to twelve locations were identified as targets by eyewitness observers in South Mumbai, they included Chhatrapati Shivaji Terminus, the Oberoi Trident, the Taj Mahal Palace & Tower, Leopold Cafe, Cama Hospital (a women and children's hospital), the Nariman House Jewish community centre, the Metro Cinema, and a lane behind the Times of India building and St. Xavier's College. There was also an explosion at Mazagaon, in Mumbai's port area, and in a taxi at Vile Parle. 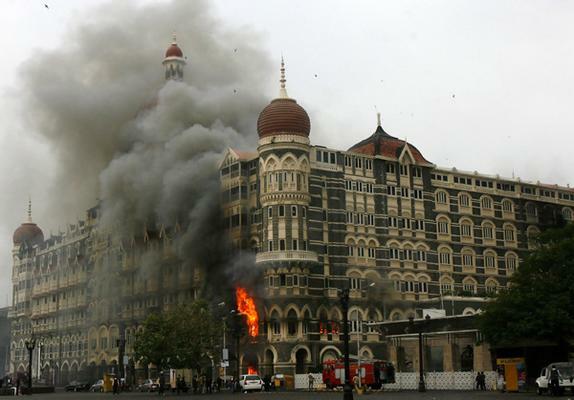 By the early morning of 28 November, all sites except for the Taj hotel had been secured by Mumbai Police and security forces. Ajmal Kasab was the only attacker arrested alive by police and is currently under arrest, disclosed that the attackers were members of Lashkar-e-Taiba, the Pakistan-based militant organization, considered a terrorist organization by India, Pakistan, the United States, the United Kingdom, and the United Nations among others. Much of the information about the attackers' preparation, travel, and movements comes from his confessions to the Mumbai police. The Indian government said that the attackers came from Pakistan, and their controllers were in Pakistan. On 7 January 2009, Pakistan's Information Minister Sherry Rehman officially accepted Ajmal Kasab's nationality as Pakistani. On 12 February 2009, Pakistan's Interior Minister Rehman Malik asserted that parts of the attack had been planned in Pakistan. A trial court on 6 May 2010 sentenced Ajmal Kasab to death on five counts.